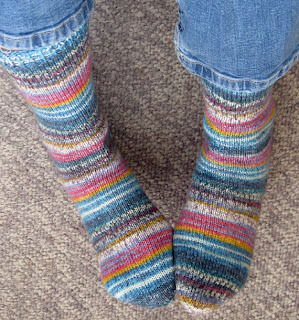 It's been quite a while since I could proclaim an FO, so I'm happy to present a completed self-patterning pair of socks. It appears that I never registered this on Ravelry and I have no idea what brand the yarn is. I can tell you isn't Opal or Trekking. It's one of those sturdy sock yarns, though. I knew I'd keep this pair for myself. I love these muted colors. I'm well into the second half of my spring break -- and I am truly enjoying it, though I have a hard time turning off my teacher brain. I spent the last few days at my parents' house. My dad has some ongoing health issues, so I've been trying to visit more frequently and help them out. Yesterday my visit overlapped with one from my brother Mike, so that was a treat. Today I'm heading out on a road trip with my friend Lisa. We have no idea where we're going, but we are going somewhere! I love my job teaching middle school Really, I do. But it isn't easy and I'm often exhausted. So, it's no wonder that I'm enjoying our spring break. 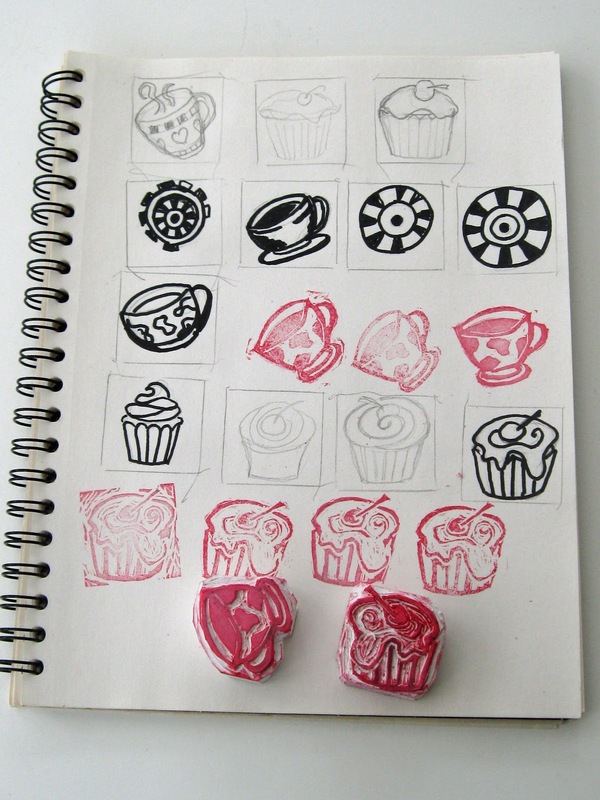 Carving my own rubber stamps. This is something I've wanted to do for a long time. 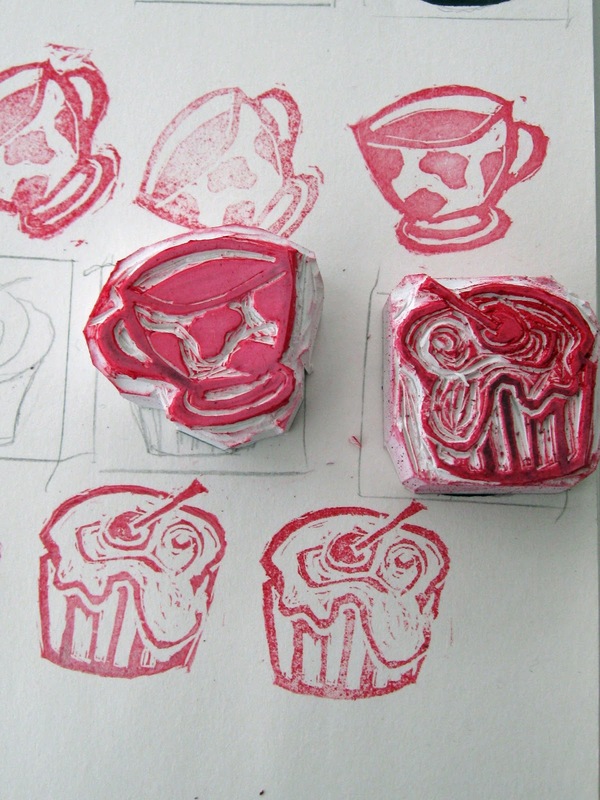 It's obvious why a coffee cup was my first project! I don't know if you can tell, but the pattern on the cup is supposed to be Holstein -- as in the cows. 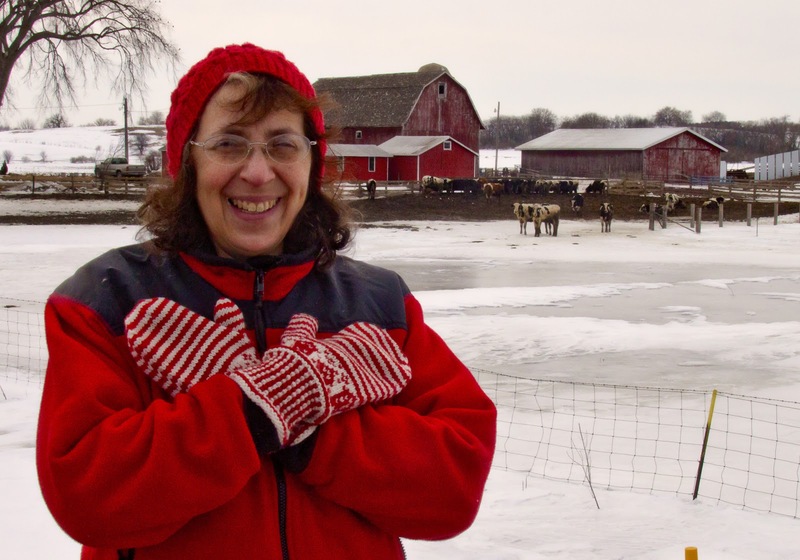 Black and white Holsteins is the main breed you'll find in Wisconsin because they produce a lot of milk. 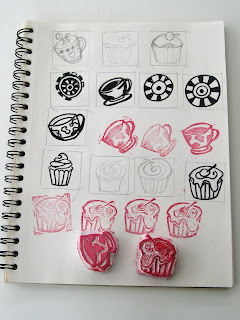 I decided to do the cupcake because I need to make up a new batch of birthday cards. It was a lot harder than the coffee cup. Here's a bit of my process. 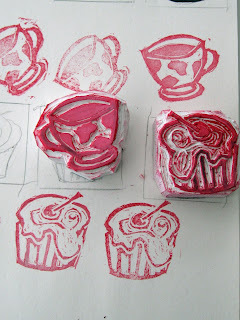 I used square blocks that were really easy to carve. They don't have any packaging, so I can't tell you what they are or how to find them. I get them at a local store. 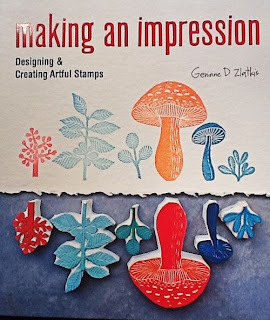 Author Gennine Zlatkis is a fabulous and inspiring artist. You can check out her blog here. Really? I have to wear a hat and mittens in the second half of March? This just doesn't seem fair! My friend Lisa snapped this photo while we were out for a walk on Saturday. We drove to the edge of town and walked along one of the bike paths. It was just a bit above freezing! A year ago, we were having highs in the 80's. I love winter, but this is even too much snow and cold for me. It's especially disappointing to have cold weather now, as my spring break begins. I was hoping to do a lot of bike riding and spring cleaning. I actually don't mind riding my bike in the cold, but there is still a lot of ice on the roads, and I'm not in the mood for any broken bones. I'd become kind of lazy about cooking lately, so I really needed something to kick-start my kitchen activities.This book was the perfect solution. 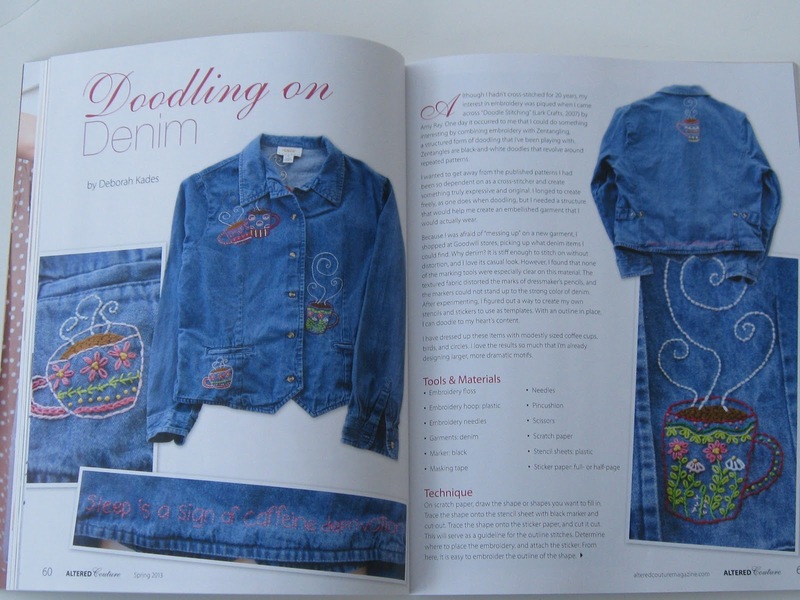 The pictures, the descriptions, the recipes -- all of those elements make this book inspiring. No doubt, some of you are already with the Smitten Kitchen, which began (and continues) as a blog. Author Deb Perelman lives in New York City and makes her magic in a very small kitchen. She churns out recipes that produce flavorful results without using exotic ingredients -- and she succeeds. I can't tell you how thrilled I am to have finally found a kale recipe that is delicious -- not something I'd eat for health reasons only. And I don't think I'll ever make mashed potatoes again without browning the butter. One thing to note: This is not a "health" food kind of book. 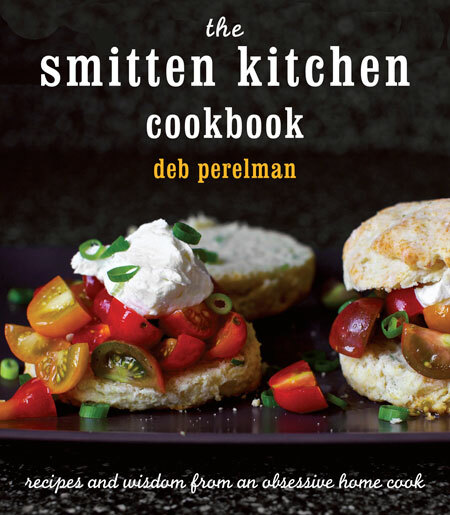 Deb Perelman does not shy away from cream or butter or sugar. That said, there are many healthy recipes, including the Gratin I mentioned above. And if you think you don't like rice pudding, try the tres leches version. It is amazing. Yes, this bracelet was knitted with beads. 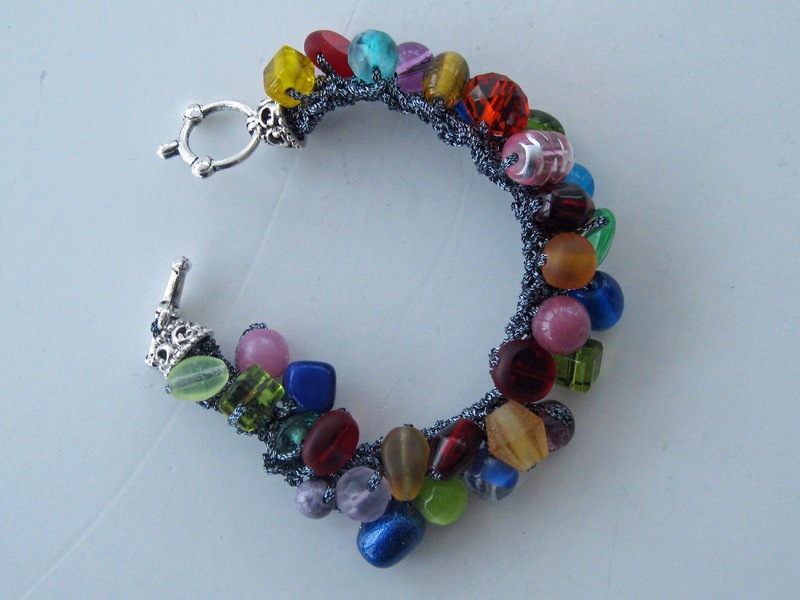 The pattern is from Beaded Bracelets to Knit, a Leisure Arts booklet by Leslieann Beller. 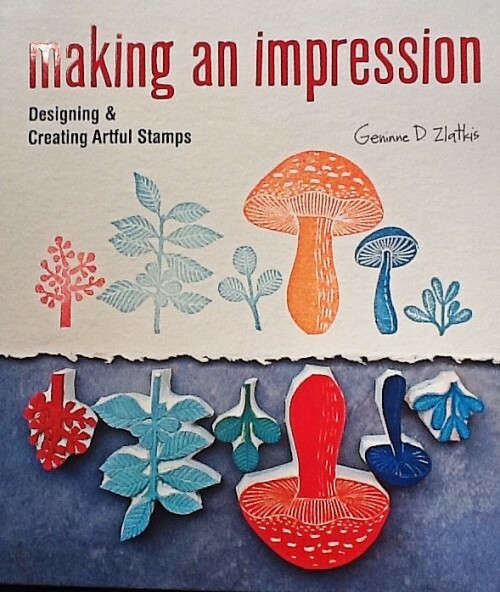 It's a great little booklet with clear directions. All the projects are knit with DMC metallic embroidery thread, which is both the key to success and the hardest part. 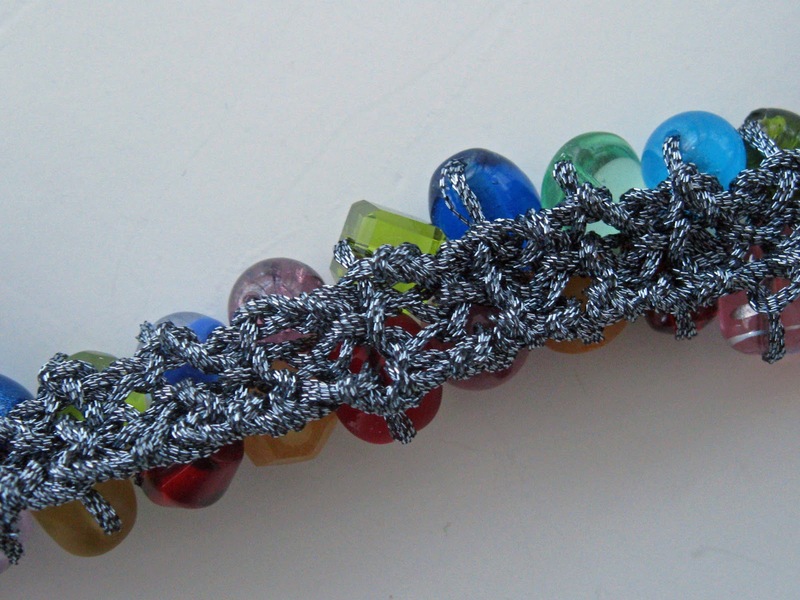 Unlike cotton embroidery thread, the threads in the metallic stuff come apart and then tangle quite easily. I had about 5 false starts before I gained a feel for using this thread. 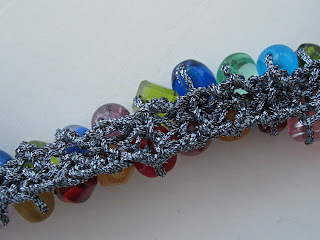 The process is quite simple: string beads onto the thread, cast on three stitches, and knit all stitches except the ones with beads, which you purl. I used a motley selection of beads from my collection. You have to make sure they all have big enough holes to slide onto the thread. 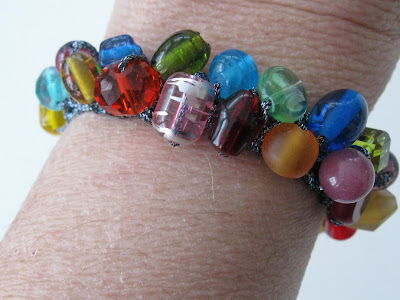 I found I needed to use a fairly tight tension to make sure the beads are firmly attached. For some reason, that process makes my right elbow hurt! For that reason, I can't turn these out as fast as I'd like to! Is there anything braver than projecting unflattering pictures of oneself onto a screen in front of a couple hundred people? Short of fighting the Taliban in Afganistan, I'm not sure there is. Which makes Amy Herzog an extremely brave woman! Amy was the March speaker for the Madison Knitting Guild, and she was fabulous. 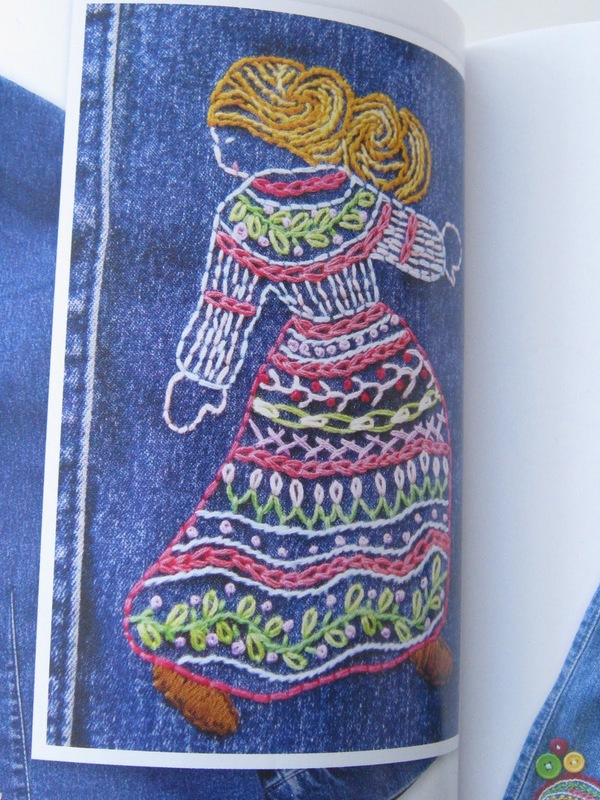 Her specialty is customizing sweaters to flatter ANY body shape. And she is very clear: all bodies are equal, none of this good or bad stuff for Amy. This is a woman who practices what she preaches. She shows pictures of her own body -- rather straight lines, heavy in the thighs, short legs -- in unflattering clothing. 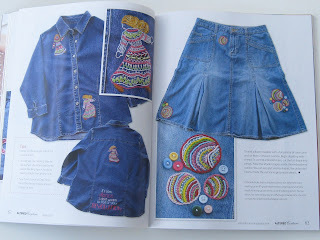 Then shows how we can use clothing to achieve the look we want. That's her in the photo above; doesn't she look great? 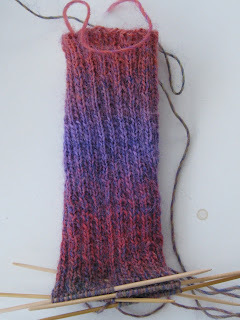 Not being much of a sweater knitter (yet! 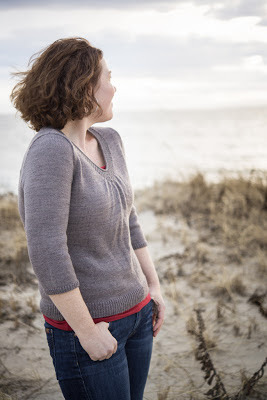 ), I don't feel I can describe the technical aspects of knitting sweaters that flatter -- but you can pre-order her book, Knit to Flatter, on Amazon.com. I can tell you that she has some fascinating ways of shaping that really work. If I ever prove I can knit a sweater, I'll definitely want it on my shelf! I am still plugging away at my Crayon Box Jacket. 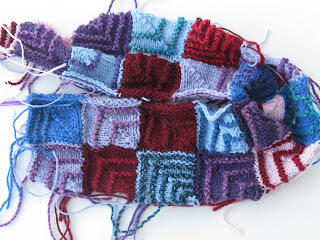 I need breaks from it because knitting the squares can be a bit tedious. However, for the most part I'm enjoying it. I've done quite a lot of the knitting to Downtown Abbey, season 3, which has been streaming on PBS. However, I didn't watch fast enough, and now I can't watch the final episode -- the one everyone talks about! Apparently the episodes only streamed for a limited time. I've also been knitting to Game of Thrones, which Keith and I are very absorbed in. I don't usually like fantasy fiction, but this really stands out. Amazing plot and characters. I tried reading the first book, but I don't like fantasy enough to put that much time into it. I blogged twice last week, and I'm aiming for at least three posts this week. We'll see if I can manage it. The clothes are from thrift stores and the embroidery is all my own original designs. I don't think I could have been so brave with brand-new clothes! I really enjoyed the freedom of embroidering on a surface I didn't have to worry about ruining. I put in the outline first and filled in without much planning. There is nothing fancy about the embroidery. I use DMC brand embroidery floss, which comes in the most beautiful colors. 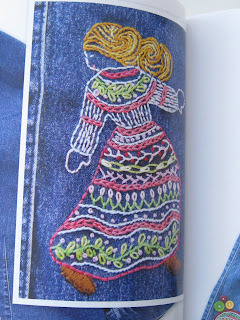 I did consult a lot of books for interesting stitches to incorporate. I did most of the work last summer, and strangely I haven't done any embroidery since. I have some ideas, but haven't had the time to plan a project. I've been drawing the dancing ladies for years, but wasn't sure where they were going to end up. 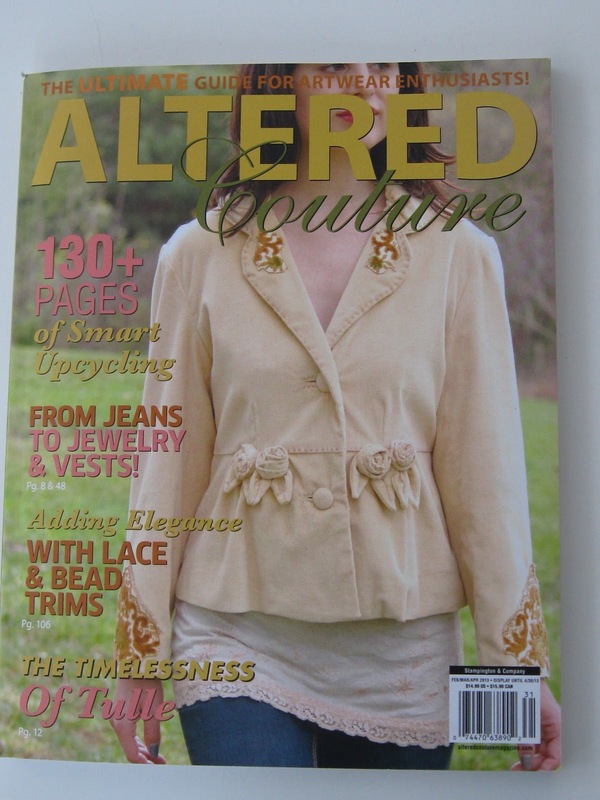 It is on newsstands now! Wow, another week has gone by without a post, and I'm feeling sad about that. It's the result of continuing craziness at school and the fact that my dad is still recovering from the fall he took in October. I always thought that life would be calmer once my kids were out of the house. I was wrong about that! Besides, I miss those two. But there has been knitting. I realized that I haven't ever knit a pair of socks for my dear friend Debbie, so I had to get right on that. I pulled out a skein of Poems Sock yarn by Wisdom Yarn, an impulse buy at the last Knitting Guild meeting I attended. It's a rustic yarn with beautiful long color changes. The yarn is a bit splitty, but not unmanageable. 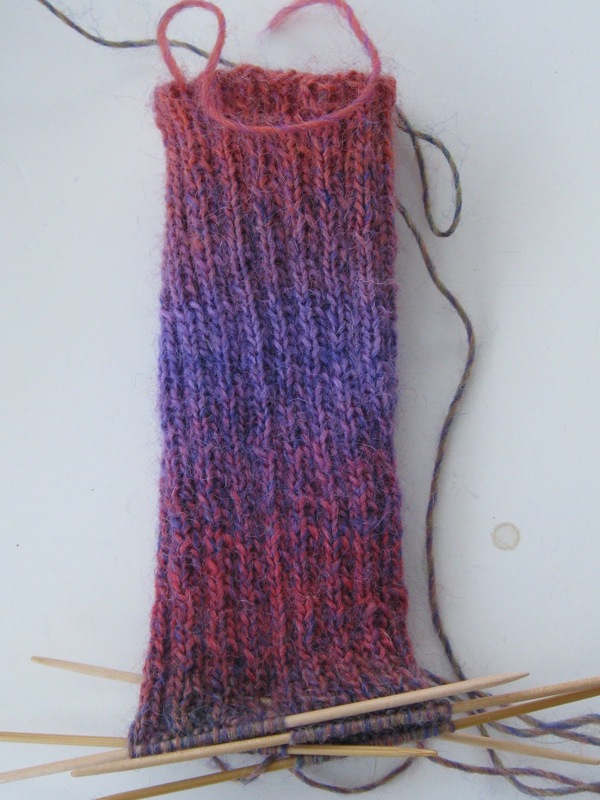 However, it seems awfully thick at some points -- sort of like knitting socks with lace-weight. It occurred to me to look up the yarn on Ravelry. I really need to do that before I buy yarn! There is nothing like the wisdom of other knitters. They also complained about the thinness, but more worryingly, they noted that it breaks easily and many said they'd never use it for socks. 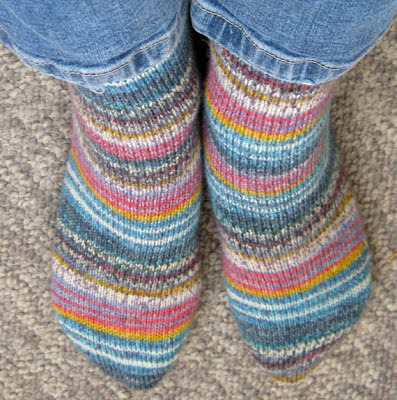 However, some knitters were perfectly happy with the socks they made.